This article is about the bridge between Manhattan and New Jersey. For the nearby bridge between Manhattan and the Bronx, see Washington Bridge. For other bridges named "Washington Bridge", see Washington Bridge (disambiguation). For the American politician, see George Washington Bridges. For the Marvel comics character, see G. W. Bridge. For the bus station, see George Washington Bridge Bus Station. The bridge, looking east from Fort Lee toward Upper Manhattan. The George Washington Bridge is a double-decked suspension bridge spanning the Hudson River, connecting the Washington Heights neighborhood of Manhattan in New York City with the borough of Fort Lee in New Jersey. The bridge is named after George Washington, the first President of the United States. As of 2016[update], the George Washington Bridge carried over 103 million vehicles per year,[a] making it the world's busiest motor vehicle bridge. :39 It is owned by the Port Authority of New York and New Jersey, a bi-state government agency that operates infrastructure in the Port of New York and New Jersey. The George Washington Bridge is also informally known as the GW Bridge, the GWB, the GW, or the George, and was known as the Fort Lee Bridge or Hudson River Bridge during construction. The idea of a bridge across the Hudson River was first proposed in 1906, but it was not until 1925 that the state legislatures of New York and New Jersey voted to allow for the planning and construction of such a bridge. Construction on the George Washington Bridge started in October 1927; the bridge was ceremonially dedicated on October 24, 1931, and opened to traffic the next day. The opening of the George Washington Bridge contributed to the development of Bergen County, New Jersey, in which Fort Lee is located. The current upper deck was widened from six to eight lanes in 1946. The six-lane lower deck was constructed beneath the existing span from 1958 to 1962 because of increasing traffic flow. The George Washington Bridge is an important travel corridor within the New York metropolitan area. It has an upper level that carries four lanes in each direction and a lower level with three lanes in each direction, for a total of 14 lanes of travel. The speed limit on the bridge is 45 mph (72 km/h). The bridge's upper level also carries pedestrian and bicycle traffic. Interstate 95 (I-95) and U.S. Route 1/9 (US 1/9, composed of US 1 and US 9) cross the river via the bridge. US 46, which lies entirely within New Jersey, terminates halfway across the bridge at the state border with New York. At its eastern terminus in New York City, the bridge continues onto the Trans-Manhattan Expressway (part of I-95, connecting to the Cross Bronx Expressway). The George Washington Bridge measures 4,760 feet (1,450 m) long and has a main span of 3,500 feet (1,100 m). It had the longest main bridge span in the world at the time of its opening and held this distinction until the opening of the Golden Gate Bridge in 1937. The bridge, looking south at sunset from the New York side of the Hudson River. The George Washington Bridge was designed by chief civil engineer Othmar Ammann, design engineer Allston Dana, and assistant chief engineer Edward W. Stearns,:163 with Cass Gilbert as consulting architect. :43, 163 It connects Fort Lee, New Jersey, with Washington Heights, Manhattan, New York. The bridge carries 14 lanes of traffic, seven in each direction. As such, the George Washington Bridge contains more vehicular lanes than any other suspension bridge, and is also the world's busiest vehicular bridge. :41 The fourteen lanes of the bridge are split unevenly across two levels: the upper level contains eight lanes while the lower level contains six lanes. The current upper level opened in 1931, and is 90 feet (27 m) wide. The upper level originally had six lanes, though two more lanes were added in 1946. Although the lower level was part of the original plans for the bridge, it did not open until 1962. The upper level has a vertical clearance of 14 feet (4.3 m), and all trucks and other oversize vehicles must use the upper level. Trucks are banned from the lower level, which has a clearance of 13.6 feet (4.1 m). All lanes on both levels are 8 feet 6 inches (2.59 m) wide. Vehicles carrying hazardous materials (HAZMATs) are prohibited on the lower level due to its enclosed nature. HAZMAT-carrying vehicles may use the upper level, provided that they conform to strict guidelines as outlined in the Port Authority's "Red Book". There are two sidewalks on the upper span of the bridge, one on each side. However, cyclists and pedestrians can usually only utilize the southern sidewalk, since the northern sidewalk is normally closed. Although the southern sidewalk allows cyclists to traverse its entire length without stopping, the northern sidewalk requires bicyclists and pedestrians to climb a pedestrian bridge on the New Jersey side. The northern sidewalk was temporarily reopened in 2017 while a temporary suicide prevention fence was installed on the southern sidewalk, in preparation for the installation of permanent fences on both sidewalks. The George Washington Bridge measures 4,760 feet (1,450 m) long and has a main span of 3,500 feet (1,100 m). Accounting for the height of the lower deck, the bridge stretches 212 feet (65 m) above mean high water at its center, and 195 feet (59 m) above mean high water under the New York anchorage. The bridge's main span was the longest main bridge span in the world at the time of its opening in 1931, and was nearly double the 1,850 feet (560 m) of the previous record holder, the Ambassador Bridge in Detroit. It held this title until the opening of the Golden Gate Bridge in 1937. The George Washington Bridge's total width is 119 feet (36 m). The original design for the George Washington Bridge's suspension towers called for them to be encased in concrete and granite in a Revival style, similar to the Brooklyn Bridge. :45 The granite was supposed to help support the steel structure of the towers, though after further scrutiny of the proposed bridge's engineering, it was found that the steel alone could support the towers. :43 It was ultimately decided that the supporting structure of the towers should be made entirely of steel, with the granite serving only as a facade. The towers would have also contained elevators to carry sightseers to the top of each tower. However, the facades were postponed in 1929 during the Great Depression. :43, 45 The entire weight of the bridge was supported by the steel structure, and the purely decorative masonry could be added at a later date. Since 1947 or 1948, the bridge has flown the world's largest free-flying American flag, measuring at 90 feet (27 m) long, 60 feet (18 m) wide, and 450 pounds (200 kg). Until 1976, the flag was taken out of a garage in New Jersey and manually erected on national holidays. During the United States' bicentennial, a mechanical hoisting system was installed, and the flag was stored along the bridge's girders when not in use. It is hoisted on special occasions when weather allows, and appears on Martin Luther King, Jr. Day, Presidents Day, Memorial Day, Flag Day, Independence Day, Labor Day, Columbus Day, and Veterans Day. Since 2006, the flag is also flown on September 11 of each year, honoring those lost in the September 11 attacks. On events where the flag is flown, the tower lights are lit from dusk until 11:59 p.m.
Until the first decade of the 20th century, passage across the lower Hudson River was possible only by ferry. :10:9 The Hudson and Manhattan Railroad and the Pennsylvania Railroad built a total of six tunnels under the lower Hudson in the 1900s. :10 The first vehicular crossing across the lower Hudson River, the Holland Tunnel, was opened in 1927, connecting Lower Manhattan with Jersey City. Plans for a vehicular bridge across the Hudson River were considered as early as 1906, during the planning for the Holland Tunnel. Three possible locations for a Hudson River bridge were considered in the vicinity of 57th, 110th, and 179th Streets in Manhattan. These three locations were considered to be the only suitable locations for suspension bridges; other sites were rejected on the grounds of aesthetics, geography, or traffic flows. In January 1924, the New York State Chamber of Commerce voted against the 57th Street location in favor of another location upstream. Despite this, the engineer Gustav Lindenthal proposed that the Hudson River bridge be built at 57th Street, and carry 16 railroad tracks and 12 lanes of automotive traffic. In May 1924, Colonel Frederick Stuart Greene, the New York Superintendent of Public Works, announced a plan to construct a suspension bridge between Fort Lee in New Jersey, and 179th Street at Fort Washington in New York. At that location, both sides were surrounded by steep cliffs (The Palisades on the New Jersey side, and Washington Heights on the New York side). Thus, it was possible to build the bridge without either impeding maritime traffic or requiring lengthy approach ramps from ground level. A New Jersey state assemblyman introduced a bill for the Hudson River bridge that December. This bill was passed in the New Jersey Assembly in February 1925. After an initial rejection by New Jersey governor George Sebastian Silzer, the Assembly made modifications before passing the bill again in March, after which Silzer signed the bill. Around the same time, the New York state legislature was also considering a similar bill. A dispute developed between New York civic groups, who supported the construction of the Hudson River Bridge; and the Parks Conservation Association, who believed that the bridge towers would degrade the quality of Fort Washington Park directly underneath the proposed bridge's deck. In late March 1925, the chairman of the Parks Conservation Association noted that the proposed New York state legislation would provide for the actual construction of the bridge, rather than just the planning. Ultimately, the Hudson River bridge bill was passed in the New York state legislature, and New York Governor Al Smith approved the bill that April. In March 1925, New Jersey governor Silzer asked Othmar Ammann to devise preliminary plans for the Hudson River bridge. Ammann found that the width of the Hudson River decreased by more than 1,000 feet (300 m) when it passed between Fort Lee and Fort Washington. The ledges of Fort Lee and Fort Washington were respectively 300 feet (91 m) and 200 feet (61 m) above mean water level at this point, which was not only ideal geography for a suspension bridge, but also allowed the bridge to be high enough to give sufficient clearance for maritime traffic. However, the differing heights meant that a large cut had to be made through the Fort Lee ledge so that the bridge approach could be built there. The same month, the New Jersey legislature asked for funds for test bores to determine if the geological strata would support the bridge. In response to continuing concerns from park preservationists, Ammann stated that placing the New York suspension tower anywhere else would make the bridge look asymmetrical, which he believed was a worse outcome than placing the tower within the park. After funding was secured, surveyors began examining feasible sites for the future bridge's approaches in August 1925. By law, the New York end of the Hudson River Bridge could only be constructed between 178th and 185th Streets, and the New Jersey end had to be built directly across the river. Geologists made 300-foot (91 m) test bores on the New Jersey side to determine if the site was feasible for laying foundations for the bridge. Othmar Ammann was hired as the bridge's chief engineer. In Ammann's original plans for the bridge, which had been published in March 1925, he had envisioned that the bridge would contain two sidewalks; a roadway that could carry up to 8,000 vehicles per hour; and space for four railroad tracks, in case the two North River railroad tunnels downstream exceeded their train capacity. Cass Gilbert was hired in January 1926 to design architectural elements for the Hudson River bridge, including the suspension towers. The bridge design had yet to be finalized, and its cost could not even be estimated at that point due to the complexity of factors. Gilbert released preliminary sketches of the Hudson River bridge that March; by then, the architect had decided that the span would be a suspension bridge. The sketch accompanied a feasibility report that Ammann and other engineers presented to the Port of New York Authority (now the Port Authority of New York and New Jersey), the agency that was to operate the bridge. The central span was to be 3,500 feet (1,100 m) long, longer than any other suspension bridge in existence at the time, and 200 feet above mean high water. The span would initially carry 4 lanes of vehicular traffic and sidewalk lanes, with space to expand the bridge deck to 8 lanes. There would also be space to build a second deck in the future below the main deck. Ammann's team also found that the most feasible location for the bridge was at 179th Street in Manhattan (as opposed to 181st or 175th Streets). This was both because the 179th Street location was more aesthetically appealing than the other two locations, and because a 179th Street bridge would be cheaper and shorter in length than a bridge at either of the other streets. At this point in the planning process, the Hudson River bridge's estimated cost was $40 million or $50 million. Because of the proposed bridge's length, engineers also had to test the strength of materials, including suspension cables, that were to be used in the span. By fall 1926, one engineer predicted that construction on the Hudson River bridge would start the following summer. In December 1926, the final plans for the bridge were approved by the public and by the War Department. The Port Authority planned to sell off $50 million worth of bonds to pay for the bridge, and the initial $20 million bond issue was sold that December. Further issues arose when the New Jersey Assembly passed a bill in March 1927, which increased the New Jersey governor's power to veto Port Authority contracts. Smith, the New York governor, and Silzer, the now-former New Jersey governor and present Port Authority chairman, both objected to the bill since the Port Authority had been intended as a bi-state venture. Afterward, the then-current New Jersey governor A. Harry Moore worked with legislators to revise the legislation. The revised law was ultimately not a significant deviation from the Port Authority's practice at the time, wherein the Port Authority was already submitting its contracts to New Jersey government for review. In April 1927, the Port Authority opened the first bids for the construction of the Hudson River bridge. It was specifically seeking bids for the construction of the New Jersey suspension tower's foundation. The Manhattan suspension anchorage's location was still undecided at this time. A bid for the New Jersey tower was awarded later that month. In May, the Port Authority opened more bids for the construction of the bridge's approaches and anchorage on the New Jersey side. Dredging operations on the Hudson River, which would allow large ships to pass underneath the bridge, also started that May. By late August, the Port Authority had started condemning plots of land for the bridge's approaches. Construction on the Hudson River bridge began on September 21, 1927, with groundbreaking ceremonies held at the sites of both future suspension towers. Each tower was to have a base with a perimeter measuring 89 by 98 feet (27 by 30 m), and descending 80 feet into the riverbed. The riverbed around the towers' sites was dredged first, and then steel pilings were placed in the riverbed to create a watertight cofferdam. The cofferdams for the bridge were the largest ever built at the time. In early October of that year, the Port Authority received bids for the construction of the bridge deck. There were two main methods being considered for the span's construction: the cheaper "wire-cable" method and the more expensive "eyebar" method. The wire-cable method, where the vertical suspender wires are attached directly to the main cables and the deck directly, would require a stiffening truss to support the deck. The eyebar method, where the suspender wires are attached to a chain of eyebars (metal bars with holes in them), would be self-supporting. :49 Ultimately, the Port Authority chose the wire-cable design because of costs, and it awarded the contract for constructing the deck to John A. Roebling Sons' Company. :49 The corresponding contract for manufacturing the steel was awarded to the McClintic-Marshall Company [Wikidata]. The first serious accident during the bridge's construction occurred in December 1927, when three men drowned while working in a caisson on the New Jersey side. Bids for the Manhattan suspension tower were advertised in March 1928. At this point, 64% of the total projected worth of construction contracts had been awarded. The piers that provided foundation for the New Jersey suspension tower and approaches were being constructed. The cliffs on both sides of the river were high enough that they could be used as anchorages for the Hudson River bridge. The towers' foundations could reach at most 190 feet (58 m) below mean low water, where the foundations would hit a layer of solid rock. In May 1928, builders started drilling a 50-foot-deep (15 m) cut through the Palisades on the New Jersey side so that the Hudson River bridge approach could be built. By June 1928, half of the money earned during the previous year's $20 million bond sale had been spent on construction. By that October, nearly all blasting operations had been completed. The suspension tower on the New Jersey side had been constructed to a height of 250 feet (76 m), and the tower on the New York side was progressing as well. The suspension towers consisted of 13 segments, each of which were almost 50 feet high. By March 1929, the concrete structure of the New York anchorage had been completed, three months ahead of schedule. The anchorage on the New Jersey side, which had been fully bored, consisted of two holes that had been bored 250 feet into the face of the Palisades. On the New Jersey side, 225,000 cubic yards (172,000 m3) of rock had to be blasted out to make way for the New Jersey approach. The suspension towers were nearly complete at the time of the report; only 100 feet of each tower's height remained to be built. Anchors were being placed in the two holes that were being drilled for the New Jersey anchorage, and this task was also nearing completion. In April, the Port Authority acquired the last of the properties that were in the path of the bridge's Manhattan approach. Plans for the Manhattan approach were approved by the New York City Board of Estimate around the same time. The approach was to consist of scenic, meandering ramps leading to both Riverside Drive and the Henry Hudson Parkway, which run along the eastern bank of the Hudson River at the bottom of the cliff in Washington Heights. The bridge would also connect to 178th and 179th Streets, at the top of Washington Heights. A third connection would be made to an underground highway running between and parallel to 178th and 179th Streets; this connection would become the 178th–179th Street Tunnels, and would later be replaced by the Trans-Manhattan Expressway. The original plan for the approach to the underground highway stated that the approach would be made using a monumental stone viaduct descending from the span at a 2.2% gradient. The Port Authority started evicting residents in the approach's path in October 1929. The same month, the Port Authority sold the final $30 million in bonds to pay for the bridge. The plans for the Hudson River bridge's Fort Lee approach were also changed in January 1930. Originally, the bridge would have terminated in a traffic circle, a type of intersection design that was being built around New Jersey during the 1920s and 1930s. However, the revised plans called for a grade-separated highway approach that would connect to a traffic "distributing basin" with ramps to nearby highways. The total cost of land acquisition for the bridge approaches on both sides of the Hudson River exceeded $10 million. A close up view of a vertical suspender cable, which is connected to the larger main cable with what is called a "saddle"
After the towers were completed, two temporary catwalks were built between the two suspension towers. :55 Then, workers began laying the bridge's four main cables, a series of thick cables that stretch between the tops of the two towers and carry what is now the upper deck. The first strand of the first main cable was hoisted between both towers in July 1929, in a ceremony attended by the governors of both states and the mayors of New York City and Fort Lee. The two temporary catwalks allowed workers to spin the wires for the main cables on-site. :55 The wires for the cables were spun by dozens of reels at a dock near the base of the New York anchorage; each reel contained 30 miles of wire at any given time. A total of 105,986 wires were used in the bridge when it was completed. After the main cables were laid, workers spun the suspender wires that connected the main cables with the deck. When it was finished, the system of cables would support 90,000 short tons (80,000 long tons) of the deck's weight, though the cables would be strong enough to carry 350,000 short tons (310,000 long tons), four times as much weight. The construction of a lower deck for rail usage was postponed, since the start of the Depression meant that there would not be enough railroad traffic to justify the construction of such a deck in the near future. View of the bridge looking north from Edgewater, New Jersey, early 1931. Note the rotary and depression-era vehicles at the foot of the photograph. In July 1930, the Port Authority opened the bidding process for contracts to build the Hudson River bridge's approaches on the New York side. These included contracts for the 178th-179th Street Tunnels and the Riverside Drive connection. The tunnel contracts were awarded later that month. In August, the bidding process for the Fort Lee approaches was opened. Bids for the Riverside Drive connection were received the following month. Prior to and during construction, the bridge was unofficially known as the "Hudson River Bridge" or "Fort Lee Bridge". The Hudson River Bridge Association started seeking suggestions for the bridge's official name in October 1930. Residents of New York and New Jersey were encouraged to send naming choices to the association, which would then forward the suggestions to the Port Authority. According to ballot voting submitted to the Port Authority, the "Hudson River Bridge" name was the most popular choice selected by residents of New York and New Jersey. The "Hudson River Bridge" name beat out a host of other proposed names, including the Port Authority's preference for the name "George Washington Bridge". The Port Authority formally adopted the "George Washington" name on January 13, 1931, honoring the general and future president's evacuation of Manhattan at the bridge's location during the Revolutionary War. This had the potential for confusion, since there was already a "Washington Bridge" connecting 181st Street with the Bronx, directly opposite Manhattan from where the "George Washington Bridge" was being built across Hudson River. Shortly afterward, the Port Authority Board of Commissioners voted to reconsider the renaming of the Hudson River Bridge, stating that it was open to alternate names. Hundreds of naming choices had been submitted by this time. The most popular naming choices were those of Washington, Christopher Columbus, and Hudson River namesake Henry Hudson. The span was again officially named for George Washington in April 1931. The system of girders to support the deck were installed throughout 1930, and the last girder was installed in late December 1930. In March 1931, the Port Authority announced that the Hudson River Bridge was set to open later that year, rather than in 1932 as originally planned. At that time, the Port Authority had opened bids for paving the road surface. Later that month, the agency published a report, which stated that the bridge's early opening date was attributable to how quickly and efficiently the various materials had been transported. In June 1931, forty bankers became the first people to cross the bridge. Work was progressing quickly on the bridge approaches in New Jersey, and the New York City government was considering building another bridge between Manhattan and the Bronx (the current Alexander Hamilton Bridge) to connect with the George Washington Bridge. Bids for constructing tollbooths and floodlight towers were opened in July 1931. The George Washington Bridge was dedicated on October 24, 1931, with a ceremony attended by 30,000 guests. The opening ceremony was accompanied by a show from military airplanes, as well as speeches from politicians including New Jersey governor Morgan Foster Larson and New York governor Franklin D. Roosevelt. The first people to cross the George Washington Bridge were reportedly two elementary school students who roller-skated across the bridge from the New York side. Pedestrians were allowed to walk the length of the George Washington Bridge between 6 p.m. and 11 p.m. The bridge was formally opened to traffic the next day. The Port Authority collected tolls for drivers who used the bridge in either direction; as with the Holland Tunnel, the toll was set at 50 cents for passenger cars, with different toll rates for other vehicle types. Pedestrians paid a toll of 10 cents each, which was lowered to 5 cents in 1934. Within the first 24 hours of the George Washington Bridge's official opening, 56,312 cars used the span, as well as 100,000 pedestrians (including those who had walked across after the ceremony). The Port Authority reported that 33,540 pedestrians crossed the bridge on the first day, of which 20,000 paid a toll to cross. During the George Washington Bridge's construction, the cost of the bridge was estimated at $75 million, and the bridge was expected to carry 8 million vehicles and 1.5 million pedestrians in its first year of operation. When the George Washington Bridge opened, it was estimated that 8 million vehicles would use the bridge in its first year, and that the bridge could ultimately carry 60 million vehicles annually after a second deck was added. The bridge's final cost was estimated at $60 million. :39 Real-estate speculators believed that the bridge's construction would raise real-estate values in Fort Lee, since the borough's residents would be able to more easily access New York City. During the construction of the George Washington Bridge, speculators spent millions of dollars to buy land around the bridge's New Jersey approach. The bridge was later credited with helping raise land prices and encouraging residential development in formerly agricultural parts of Bergen County. It also spurred the rise of the trucking industry along the United States' East Coast, supplanting much of the freight railroads that used to carry cargo. In the George Washington Bridge's first week of operation, the bridge carried 116,265 vehicles, compared to the Holland Tunnel's 173,010 vehicles, despite the fact that the tunnel had fewer lanes than the bridge did. During that time span, 56,000 pedestrians used the bridge. A week after the bridge opened, the 10-lane tollbooth was expanded to 14 lanes because of heavy weekend traffic volumes. In its first year of operation, the George Washington Bridge saw 5.5 million vehicular crossings and nearly 500,000 pedestrian crossings. New Jersey Route 4, which connected directly to the bridge's western end, opened in July 1932. The 178th-179th Street Tunnels, which connected Amsterdam Avenue on the eastern side of Manhattan to the bridge's eastern end on the west side of Manhattan, were supposed to be completed in fall 1932. The tunnels, as well as direct approaches to Riverside Drive and the Hudson River Parkway, were not completed until 1938-1939. A ramp eastward from the bridge and southward to the Harlem River Drive was also completed around this time. On the New Jersey side, state highways were also being modernized to handle bridge traffic. The bridge's westbound entrance ramp from Fort Washington Avenue, at the top of the cliff on the Manhattan side, opened in April 1939. The corresponding eastbound exit ramp, as well as the 178th-179th Street Tunnels, opened that July. USS Nautilus passes under the bridge in 1956, when the bridge had only a single deck. Traffic counts on the George Washington Bridge grew year after year. By the time of the bridge's tenth anniversary in 1941, the span had been used by 72 million vehicles total, including a record 9.1 million vehicles in 1940. Originally, the George Washington Bridge's single deck consisted of six lanes, with an unpaved center median. In 1946, the median was paved over and two more lanes were created on the upper level, widening it from six lanes to eight lanes. :39 The two center lanes on the upper level served as reversible lanes, which could handle traffic in either direction depending on traffic flows. However, a fixed median was not added until the 1970s. The bridge was initially lit by 200 lights to provide warning to pilots flying at night. The Port Authority enacted a photography ban during World War II in the 1940s. Additionally, from May 1942 to May 1945, the lights on the bridge were shut off at night as a precautionary measure. After the war ended, the lights were turned back on, but the photography ban was upheld. The completion of the George Washington Bridge's lower deck, as well as the construction of a new bus terminal and other highway connections near the bridge, were recommended in a 1955 study that suggested improvements to the New York City area's highway system. The lower deck was approved by the U.S. Army Corps of Engineers. A Bergen County leader voted against the construction of the lower level in 1956, temporarily delaying construction plans. The New York City Planning Commission approved the George Washington Bridge improvement in June 1957, and the Port Authority allocated funds to the improvement that July. The $183 million project included the construction of the lower deck; the George Washington Bridge Expressway, a 12-lane expressway connecting to the Alexander Hamilton Bridge and the Cross Bronx Expressway (present-day I-95 and US 9); the George Washington Bridge Bus Station above the expressway; and a series of new ramps to and from the Henry Hudson Parkway. On the New Jersey side, two depressed toll plazas, one in each direction, were to be constructed for lower level traffic. Highway connections were also being built on the New Jersey side, including a direct approach from I-95. Construction of the approaches started in September 1958. Work on the lower level itself started on June 2, 1959, but work was briefly halted later that year because of a lack of steel. By February 1960, construction was underway on the lower level; the supporting steelwork for the future deck had been completed, and the sections for the lower deck were being installed. The George Washington Bridge's lower deck would comprise 75 steel slabs; each slab weighed 220 tons and measured 108 feet (33 m) wide by 90 feet (27 m) feet long, with a thickness of 130 feet (40 m). The construction of the slabs proceeded from either side of the bridge. The right-of-way for the George Washington Bridge Expressway had been almost entirely cleared except for the ventilation buildings for the 178th-179th Street Tunnels. The segments of the lower deck had been laid completely by September 1960, at which point workers started pouring the concrete for the deck's roadway, a process that took five weeks. The layer of concrete measured 4 inches (10 cm) thick. Finally, the deck was paved over with a 2.5-inch (6.4 cm) layer of asphalt. New ramps to the George Washington Bridge in New Jersey, including from the newly completed I-95, opened in summer 1962. The lower deck was opened to the public on August 29, 1962. The lower level, nicknamed "Martha" after George's wife Martha Washington,:81–82 increased the capacity of the bridge by 75 percent, and simultaneously made the George Washington Bridge the world's only 14-lane suspension bridge. In addition to providing extra capacity, the lower level served to stiffen the bridge in high winds; before the lower deck was constructed, the George Washington Bridge was known to swing up to 30 inches (76 cm). The George Washington Bridge Bus Station and the Alexander Hamilton Bridge both opened on January 18, 1963, thus allowing more traffic to use the George Washington Bridge. In the first year after the lower level's opening, the expanded bridge had carried 44 million vehicles. By comparison, 35.86 million vehicles had crossed the bridge in an 11-month period between September 1, 1961 and July 31, 1962. In addition, traffic congestion at the George Washington Bridge had been reduced since the lower level opened, and the Port Authority was able to make repairs to the upper level for the first time in the bridge's history. In 1980, the bridge carried 82.8 million vehicles. The George Washington Bridge was designated a National Historic Civil Engineering Landmark by the American Society of Civil Engineers on October 24, 1981, the 50th anniversary of the bridge's dedication ceremony. The 50th anniversary was also marked with a parade of automobiles. At that point, 1.8 billion vehicles had used the bridge throughout its lifetime. In 1990, the Port Authority announced a minor rehabilitation for the George Washington Bridge. As part of the project, the supporting structural steel for the upper deck would be replaced, and some ramps would be rebuilt. The ramps on the New York side, connecting with Riverside Drive and the Henry Hudson Parkway, were to be reconstructed for $27.6 million after studies in the late 1980s showed deterioration on these ramps. Although the Port Authority had announced the repairs in advance, the start of roadwork in September 1990 caused extensive traffic jams. Starting on July 4, 2000, and for subsequent special occasions, each of the George Washington Bridge's suspension towers is illuminated by 380 light fixtures that highlight the exposed steel structure. On each tower there are a mix of 150 and 1000 watt metal halide lamp fixtures. The architectural lighting design was completed by Domingo Gonzalez Associates. In 2000, the Port Authority proposed building a ramp from the lower level to the Palisades Interstate Parkway on the New Jersey side. Originally, the ramp would have cost $86.5 million and would have been completed in 2003 or 2004. However, the connection was ultimately not built. From September 9 to 13, 2013, dedicated toll lanes for one of the local Fort Lee entrances to the bridge's upper level were reduced from three to one, with the two other lanes diverted to highway traffic, without notification to local government officials and emergency responders. The closures were performed on orders from aides and appointees of New Jersey Governor Chris Christie causing a political controversy called "Bridgegate". The local toll lane reductions caused massive traffic congestion, with major delays for school transportation and police and emergency service responses within Fort Lee. The repercussions and controversy surrounding these actions have been investigated by the Port Authority, federal prosecutors, and a New Jersey legislature committee. In December 2011, the Port Authority announced plans to repair the bridge. For the first time, the vertical suspender cables would be replaced, at an expected cost of more than $1 billion paid for by toll revenue. On August 5, 2013, repair crews began an $82-million effort to fix cracks in upper-deck structural steel caused by traffic, particularly heavy trucks. The plan called for replacing 632 road deck panels, which would add at least 20 years of service life to the roadway. The work proceeded at night, and was slated to be complete by year's end. However, delays prevented completion and ultimately the work was halted for the winter. Work restarted in June 2014, and was expected to last another 12 weeks. The Port Authority also started work on some other projects to renovate or replace bridge components. The lower level was repaved in 2016, and repainting work and maintenance platform replacement on the lower deck was expected to be completed in 2017. The bridge's 592 suspender ropes, which run vertically between the main suspension cables and the deck, were to be replaced between 2017 and 2023. The staircases leading to the sidewalks on both the northern and southern sides of the upper deck were also being replaced with ramps that were compliant with the Americans with Disabilities Act of 1990. The Trans-Manhattan Expressway was being renovated in conjunction with this project. On the New Jersey side, the Palisades Interstate Parkway cloverleaf ramp onto the eastbound George Washington Bridge would be replaced at a cost of $112.6 million by 2019. Two overpasses near the bridge would also be refurbished by 2022. On the New York side, the 12-lane Trans-Manhattan Expressway heads east across the narrow neck of Upper Manhattan, from the bridge to the Harlem River. It provides access from both decks to 178th and 179th Streets, which cross Manhattan horizontally; the Henry Hudson Parkway and Riverside Drive, on the Hudson River's eastern bank along the west side of Manhattan; and to Amsterdam Avenue and the Harlem River Drive, on the Harlem River's western bank on the east side. The expressway connects directly with the Alexander Hamilton Bridge, which spans the Harlem River as part of the Cross-Bronx Expressway (I-95), providing access to the Major Deegan Expressway (I-87). Heading towards New Jersey, local access to the bridge is available from 179th Street. There are also ramps connecting the bridge to the George Washington Bridge Bus Terminal, a commuter bus terminal with direct access to the New York City Subway at the 175th Street station on the IND Eighth Avenue Line (served by the A train). Further north within the New York metropolitan area, the Tappan Zee Bridge (Interstates 87/287 and New York State Thruway) avoids the congested Cross Bronx Expressway and the city proper. Thruway traffic sometimes uses the George Washington Bridge as a detour, since there are no road crossings of the Hudson River between the George Washington and the Tappan Zee Bridges. The Tappan Zee Bridge also charges tolls for eastbound drivers. Eastbound vehicles must pay a toll to cross the bridge; as with all Hudson River crossings along the North River, westbound vehicles cross for free. As of December 6, 2015, the cash tolls going from New Jersey to New York are $15 for both cars and motorcycles. E-ZPass users are charged $10.50 for cars and $9.50 for motorcycles during off-peak hours, and $12.50 for cars and $11.50 for motorcycles during peak hours. Trucks are charged cash tolls of $20.00 per axle, with discounted peak, off-peak, and overnight E-ZPass tolls. A discounted carpool toll ($6.50) is available at all times for cars with three or more passengers using NY or NJ E-ZPass, who proceed through a staffed toll lane (provided they have registered with the free "Carpool Plan"). There is an off-peak toll of $7.00 for qualified low-emission passenger vehicles, which have received a Green E-ZPass based on registering for the Port Authority Green Pass Discount Plan. Tolls are collected at a series of tollbooths on the New Jersey side. The bridge has 29 toll lanes: 12 in the main upper-level toll plaza, 10 in the lower-level toll plaza, and seven in the Palisades Interstate Parkway toll plaza leading to the upper level. The toll plazas on the lower level and Palisades Parkway are not staffed during the overnight hours and accept only E-ZPass transactions during this period. Originally, tolls were collected in both directions. The original toll booth was designed by Gilbert, who also designed a classical-style maintenance booth, neither of which is extant. :71 In August 1970, the toll was abolished for westbound drivers, and at the same time, eastbound drivers saw their tolls doubled. The tolls of eleven other New York–New Jersey and Hudson River crossings along a 130-mile (210 km) stretch, from the Outerbridge Crossing in the south to the Rip Van Winkle Bridge in the north, were also changed to eastbound-only at that time. E-ZPass was accepted for toll payment on the George Washington Bridge starting in July 1997. Soon afterward, the Port Authority proposed removing the tollbooths for the E-ZPass lanes on the lower level and Palisades Parkway toll plazas, replacing them with electronic toll collection gantries to allow motorists to maintain highway speeds. Pedestrians and cyclists may cross free of charge on the south sidewalk. Pedestrians traveling in either direction originally paid tolls of 10 cents when the bridge opened. The pedestrian toll was reduced to 5 cents in 1935 and discontinued altogether in 1940. In January 2007, the Port Authority of New York and New Jersey announced a two-year, $3.2-million deal with GEICO, the auto insurance giant, that would have posted a large billboard atop the toll plaza that said "GEICO Drive Safely," along with GEICO signs on the tollbooths and approach roads. A week later, however, the Port Authority canceled the contract after critics said the signs would mar the landmarked bridge, that the Port Authority had failed to negotiate a good price for the deal, and that the signs might violate Fort Lee's regulations. Tolls for the bridge cost $.50 one way in 1931, but have been raised over the years to the current $15 cash toll for passenger vehicles, which was enacted on December 6, 2015. The George Washington Bridge contains two sidewalks that can be used by pedestrians and bicyclists. The southern sidewalk (accessible by a long, steep ramp on the Manhattan side of the bridge) is shared by cyclists and pedestrians. The entrance in Manhattan is at 178th Street, just west of Cabrini Boulevard which also has access to the Hudson River Greenway north of the bridge. The sidewalk is accessible on the New Jersey side from Hudson Terrace. The George Washington Bridge carries New York State Bicycle Route 9, a bike route that runs from New York City north to Rouses Point. The Port Authority closed the northern sidewalk at all times in 2008. Though it offers direct access into Palisades Interstate Park, the northern sidewalk requires stairway climbs and descents on both sides, which was inaccessible for people with physical disabilities and posed a risk in poor weather conditions. Advocacy groups such as Transportation Alternatives also suggested improvements. As part of the project to replace the bridge's vertical support cables, the connections to both sidewalks will be enhanced or rebuilt and made ADA-compliant. While the south-side cables are being replaced, that sidewalk will be closed and the north sidewalk will be open. Once the entire project is completed in 2023, pedestrians will use the south sidewalk and bicycles will use the north sidewalk. The sidewalk aspect of the project is expected to cost $118 million. The George Washington Bridge is among the most frequently chosen sites in the New York metropolitan area for committing suicide by jumping or falling off the bridge. The first death by jumping occurred before the bridge even opened, though it was unintentional. On September 21, 1930, a stunt jumper named Norman J. Terry jumped off what is now the bridge's upper deck in front of a crowd of thousands, but because his body was facing the wrong way, he broke his neck upon hitting the water. The first intentional suicide occurred on November 3, 1931, a little more than one week after the bridge opened. Several suicide attempts off the George Washington Bridge have been widely publicized. In 1994, a person going by the name "Prince" called The Howard Stern Show while on the bridge, threatening to commit suicide, but Howard Stern managed to talk him out of it. The 2010 suicide of Tyler Clementi, who had jumped from the bridge, drew national attention to cyberbullying and the struggles facing LGBT youth. In 2012, a record 18 people threw themselves off the bridge to their deaths, with 43 suicide attempts overall. There were 18 deaths reported in both 2014 and 2015. In 2014, there were 74 people were stopped by the Port Authority police, while the next year, another 86 people were stopped by the Port Authority police. In 2016, there were 12 reported deaths, a decrease from previous years, while 70 people were stopped by the Port Authority police. In 2017, the Port Authority proposed equipping a two-person Emergency Services Unit team with harnesses to prevent suicides from the bridge. Following 15 reported deaths and 68 attempts in 2017, the Port Authority installed protective netting and an 11-foot-high (3.4 m) fence along each upper level sidewalk. The netting partially overhangs the sidewalks in order to prevent potential jumpers from scaling the fence directly. The southern sidewalk was closed from September to December 2017 so that a temporary fence could be installed there. Once the temporary fence had been erected, the permanent 11-foot-high barrier was constructed on the northern sidewalk, followed by the permanent barrier on the southern sidewalk. On December 28, 1966, a 19-year-old pilot made an emergency landing on the bridge's New Jersey side after his plane's engine failed. There were no deaths reported, because there was very little traffic at the time, but the pilot and his passenger were injured. At the time, there was no median barrier on the bridge's upper deck. In June 1977, two tractor-trailers nearly fell off the lower level after jackknifing, then going through both the roadway barrier and a mesh net next to the roadway. One of the drivers was hurt slightly, while the other driver was not hurt. The accident also involved a third tractor-trailer and two passenger cars, none of whose occupants were hurt. Accidents involving trucks dumping their cargo have also occurred on the George Washington Bridge. Watermelons, frozen chicken parts, and horse manure have all fallen onto the bridge's roadway at some point. The first-ever complete closure of the George Washington Bridge occurred on August 6, 1980, when a truck carrying highly flammable propane gas across the bridge started to leak. As a safety precaution in case the fuel started to ignite, traffic across the bridge was halted for several hours, and 2,000 people living near the bridge were evacuated. Since the George Washington Bridge is the primary crossing between New Jersey and New York City, the closure caused traffic jams that stretched for up to 30 miles, and the effects of this congestion could be seen more than 45 miles away. Two police officers eventually plugged the leak with an inexpensive device. Up to that point, trucks carrying flammable material had been allowed to use the George Washington Bridge. After the incident, New York City officials conducted a study on whether to prohibit hazardous cargo from traveling through the city. The bridge has been featured in music. In the opening singalong for the children's TV series Sesame Street, Ernie often sang the words "George Washington Bridge" to the tune of Sobre las Olas ("The Loveliest Night of the Year"). :133–134 William Schuman's 1950 work for concert band is called George Washington Bridge. :133 Other media have also featured the George Washington Bridge. In the first issue of the comic Atomic War! published in November 1952, the George Washington Bridge is shown collapsing during a bombing of New York City. Additionally, painters George Ault and Valeri Larko have both created artworks named after the bridge. :130 Video games such as Metal Gear Solid 2: Sons of Liberty also showed the George Washington Bridge. Several books have been written about the George Washington Bridge. The construction of the bridge is detailed in the books George Washington Bridge: A Timeless Marvel and George Washington Bridge: Poetry in Steel. The bridge and the nearby Little Red Lighthouse are the subjects of Hildegarde Swift's 1942 children's book The Little Red Lighthouse and the Great Gray Bridge. ^ In 1910, the Washington Chapter of the Daughters of the American Revolution erected a stone monument to the Battle of Fort Washington. The monument is about 100 yards (91 m) northeast of the Little Red Lighthouse, near the eastern bridge anchorage. ^ MTA Bridges and Tunnels collects tolls for the Verrazzano-Narrows Bridge while the Port Authority collects tolls for the other three bridges to Staten Island. 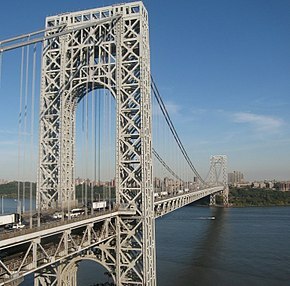 ^ a b c d e f g h i j k l "Facts & Info - George Washington Bridge". Port Authority of New York and New Jersey. Retrieved February 27, 2010. ^ a b c d "George Washington Bridge". ASCE Metropolitan Section. Retrieved November 12, 2016. ^ a b c d "Traffic Restrictions - George Washington Bridge". The Port Authority of NY & NJ. Retrieved June 18, 2018. ^ a b c d e f g h i j k l m n o p q r s t u v w x y z aa ab ac ad Rastorfer, D. (2000). "Chapter 2: The George Washington Bridge". Six Bridges: The Legacy of Othmar H. Ammann. Six Bridges: The Legacy of Othmar H. Ammann. Yale University Press. ISBN 978-0-300-08047-6. Retrieved September 18, 2018. ^ * Rose, Lacey (March 2, 2006). "Inside the Booth". Forbes. Retrieved January 15, 2008. Like the PATH trains, which also connect New York to New Jersey, the G.W. Bridge is run by the Port Authority of New York and New Jersey, a public agency that employees 7,000 workers and has annual revenues of $2.9 billion. Ervolino, Bill (October 24, 2018). "Happy birthday George Washington Bridge! You look pretty good for 87". North Jersey. Retrieved January 12, 2019. By 1962, New Jerseyans were routinely referring to Ammann's masterpiece as "the GWB" and "the George." Jones, Charisse (October 20, 2006). "Upkeep Costs Rise as USA's Bridges Age". USA Today. Retrieved January 15, 2008. The George Washington Bridge — locals call it 'the GW' — is one of a collection of dazzling spans that link New York's five boroughs or the city and New Jersey. ^ a b c d e "HUDSON BRIDGE IS NEARER REALIZATION; Jersey Chooses a Location -- Gov. Smith Favors Project Without Naming Site". The New York Times. March 1, 1925. ISSN 0362-4331. Retrieved June 1, 2018. ^ a b c d "LAST WIRE OF SPAN SPUN OVER HUDSON; Port Authority Head Starts Flag Decked Carrier Across River With Tiny Wire. FINISHES MIGHTY CABLES Workers Begin Clamping Strands of Supports Capable of Carrying 350,000 Ton Burden". The New York Times. August 8, 1930. Retrieved September 18, 2018. ^ "Allston Dana Is Engineer of Design for the Ft. Lee Bridge". Scarsdale Inquirer (Volume XI, Number 6). Scarsdale Women's Club Publications. December 27, 1927. Retrieved September 17, 2018. ^ a b c d e f g h i j "George Washington Bridge 80th Anniversary". The Port Authority of NY & NJ. October 25, 2011. Retrieved June 18, 2018. ^ a b c d e f g Ingraham, Joseph C. (August 30, 1962). "Lower Deck of George Washington Bridge Is Opened". The New York Times. Retrieved March 6, 2010. ^ Collins, Beth (December 2, 2011). "CNN Travel". CNN Travel. Retrieved November 13, 2018. ^ a b "Two Governors Open Great Hudson Bridge As Throngs Look On". The New York Times. October 25, 1931. Retrieved March 6, 2010. ^ a b "History - George Washington Bridge". Port Authority of New York and New Jersey. Retrieved March 6, 2010. ^ "New York City Truck Route Map: Reverse Side" (PDF). nyc.gov. New York City Department of Transportation. June 8, 2015. Retrieved September 12, 2017. ^ For the Red Book itself, see: "HAZARDOUS MATERIALS: Transportation Regulations at Tunnel and Bridge Facilities" (PDF). The Port Authority of NY & NJ. Retrieved June 18, 2018. ^ "Pedestrian & Bicycle Information - George Washington Bridge". The Port Authority of NY & NJ. Retrieved June 18, 2018. ^ a b c "Suicide Prevention Fence Coming To George Washington Bridge Walkway « CBS New York". CBS New York. September 18, 2017. Retrieved November 23, 2018. ^ a b Krisel, Brendan (September 19, 2017). "Safety Fences Coming To George Washington Bridge Walkways". Washington Heights-Inwood, NY Patch. Retrieved November 23, 2018. ^ "TIDES OF BRIDGE TRAFFIC; With a Capacity of 30,000,000 Cars a Year, the New Span Promises Relief From Congestion". The New York Times. October 18, 1931. Retrieved June 18, 2018. ^ "THE WORLD'S GREAT SPANS; Detroit River Bridge Was Longest From Pier to Pier Until the New Hudson Structure Was Completed East River Bridges". The New York Times. October 18, 1931. ISSN 0362-4331. Retrieved June 8, 2018. ^ a b c d e Carmody, Deirdre (October 10, 1981). "A 50-YEAR VIEW OF THE GEORGE WASHINGTON BRIDGE". The New York Times. Retrieved June 25, 2018. ^ a b Billington, D.P. (1985). The Tower and the Bridge: The New Art of Structural Engineering. Princeton paperbacks. Princeton University Press. p. 136. ISBN 978-0-691-02393-9. Retrieved November 14, 2018. ^ a b c d e Skinner, Frank W. (October 18, 1931). "HOW THE BRIDGE WAS BUILT; Unusual Difficulties Were Overcome in Erecting the Towers and Spinning and Stretching the Cables An Unusual Task, Digging to Place Foundations. Anchorage Tunnels. Spinning the Wire. A Terrific Stress. Composition of the Cables. A Five-Year Record. American Builders Lead". The New York Times. ISSN 0362-4331. Retrieved June 8, 2018. ^ a b c d Eddy, J. l., Jr. (May 25, 1930). ""WEAVING" A GREAT SPAN OVER THE HUDSON RIVER; THE HUDSON BRIDGE TAKES FORM - The New York Times". The New York Times. ISSN 0362-4331. Retrieved June 6, 2018. ^ a b "FORT LEE CONTRACT GOES TO ROEBLING; Port Authority Finds Wire Cable Type of Bridge Is Cheaper Than Eye Bar. FIRM'S BID IS $12,339,977 McClintoc-Marshali Company Gets $10,134,440 Steel Tower and Floor Work". The New York Times. October 14, 1927. ISSN 0362-4331. Retrieved June 5, 2018. ^ a b c "American Bridge Plan Looms as Victor in Keen Hudson Span Controversy" (PDF). Brooklyn Daily Eagle. October 9, 1927. pp. A11. Retrieved June 5, 2018 – via Fultonhistory.com. ^ a b c "WORK IS SPEEDED ON HUDSON BRIDGE; Massive Anchorage on New York Side Finished 3 Months Ahead of Schedule. TO RUSH TOWER ERECTION Port Authority Says Slinging of Cables Now is Expected to Start in Midsummer. PALISADES ARE TUNNELED Sightseers Will Have Elevators to Take Them Up in 600-Foot Steel Towers. Unusual Conditions Met. Elevators for Sightseers". The New York Times. March 24, 1929. ISSN 0362-4331. Retrieved June 5, 2018. ^ a b c "Sketch of Proposed $40,000,000 Bridge Across the Hudson". The New York Times. March 11, 1926. ISSN 0362-4331. Retrieved June 3, 2018. ^ Billington, David P. (1985). The Tower and the Bridge: The New Art of Structural Engineering. Princeton University Press. p. 134. ISBN 069102393X. ^ a b c Richman, Steven M. The Bridges of New Jersey: Portraits of Garden State Crossings, p. 118. Rutgers University Press, 2005. ISBN 9780813535104. "The engineer, Othmar Ammann, and his architect, Cass Gilbert, had originally designed statuesque anchors, which were abandoned for cost reasons." ^ Brock, H. i (September 6, 1931). "A SPAN THAT SYMBOLIZES THE STEEL AGE; Bare of Masonry, the Great Memorial Bridge Over the Hudson Breaks With the Tradition of Monuments A SYMBOL OF THE AGE OF STEEL". The New York Times. ISSN 0362-4331. Retrieved June 8, 2018. ^ "CRITICIZE MASONRY FOR HUDSON BRIDGE; Experts Question Architectural Integrity of Concealing Steel Beneath Stone. FRENCH BRANDS IT A". The New York Times. July 7, 1929. ISSN 0362-4331. Retrieved June 5, 2018. ^ a b Berkowitz, Natalie (July 2, 1989). "Old Glory Fills Crew With Pride". The New York Times. Retrieved September 13, 2018. ^ "George Washington Bridge Interesting Facts" (PDF). Port Authority of New York and New Jersey. Archived from the original (PDF) on December 14, 2006. Retrieved May 28, 2007. ^ a b "World's Largest Free-Flying American Flag to Fly at George Washington Bridge in Honor of 9/11 Victims" (Press release). Port Authority of New York and New Jersey. September 8, 2006. Retrieved February 27, 2010. ^ a b "85 Years Strong, George Washington Bridge Still Adds Grace to NYC Skyline". ASCE News. June 21, 2018. Retrieved January 12, 2019. ^ Renner, James (January 1998). "DAR Monument". Washington Heights & Inwood Online. Archived from the original on September 25, 2010. Retrieved March 13, 2010. ^ National Park Service (April 15, 2008). "National Register Information System – Holland Tunnel (#93001619)". National Register of Historic Places. National Park Service. Retrieved May 19, 2018. ^ "GREAT CROWD TREKS INTO HOLLAND TUBES AFTER GALA OPENING; Thousands Pour In as Coolidge on Yacht Turns Switch With Golden Key. AUTOS START AT MIDNIGHT Hundreds of Honking Cars Rush Through Tunnels From New York and Jersey Sides. OFFICIALS HAIL THE EVENT Governor Smith, Governor Moore, Edwards, Edge and Others Extol Engineering Triumph. Impressive Ceremonies in Two States Mark Opening of Holland Tunnel SCENES AT THE OPENING OF THE HOLLAND TUNNEL UNDER THE HUDSON". The New York Times. November 13, 1927. ISSN 0362-4331. Retrieved May 9, 2018. ^ a b "Vehicular Tunnel Under the Hudson Seems Assured". New York Sun. January 26, 1919. pp. 1, 7 – via Fultonhistory.com. ^ "WANT THREE BRIDGES ACROSS NORTH RIVER; Engineers Favor Structures to Jersey at 57th, 110th, and 179th Streets. COST WOULD BE HEAVY They Recommend Also Bridges from Staten Island to Bayonne, Elizabethporf, and Perth Amboy". The New York Times. December 6, 1908. ISSN 0362-4331. Retrieved May 3, 2018. ^ "TUNNELS NOT BRIDGE FAVORED TO JERSEY; New York State Commission Implies in Report That Cost of Span Is Prohibitive". The New York Times. April 22, 1913. ISSN 0362-4331. Retrieved May 4, 2018. ^ "CHAMBER OPPOSES BRIDGE AT 57TH ST.; State's Business Men Fear a Structure Over the Hudson Would Hinder Shipping. SUPPORT PORT AUTHORITY Favor a Crossing Further Upstream -- Vehicular Tunnel Is Warmly Debated". The New York Times. January 4, 1924. ISSN 0362-4331. Retrieved June 1, 2018. ^ Lindenthal, Gustav (January 13, 1924). "Lindenthal Outlines Hudson Bridge Plan". The New York Times. ISSN 0362-4331. Retrieved June 1, 2018. ^ "GREENE TELLS PLAN FOR HUDSON BRIDGE; Colonel Would Utilize Palisades Instead of Tower for Cables at New Jersey End". The New York Times. May 4, 1924. ISSN 0362-4331. Retrieved June 1, 2018. ^ "FOR NEW HUDSON BRIDGE. ; Bill Will Be Introduced in the New Jersey Assembly". The New York Times. December 30, 1924. ISSN 0362-4331. Retrieved June 1, 2018. ^ "ARTHUR KILL SPANS VOTED IN TRENTON; Senate Passes Bill Calling for Bridges From Perth Amboy and Elizabeth. EDGE SPEAKS FOR MEASURE Gov. Silzer Asks That Faults Be Removed From Law Barring Women From Night Work". The New York Times. February 11, 1925. ISSN 0362-4331. Retrieved June 1, 2018. ^ "PASS FORT LEE BRIDGE BILL. ; Jersey Assemblymen Concur in Changes Requested by Silzer". The New York Times. March 3, 1925. ISSN 0362-4331. Retrieved June 1, 2018. ^ "SILZER SIGNS BILL FOR HUDSON BRIDGE; Measures for Perth Amboy-Elizabethtown-Staten Island Spans Also Become Laws". The New York Times. March 10, 1925. ISSN 0362-4331. Retrieved June 1, 2018. ^ "TO FIGHT FOR BRIDGE AT 178TH STREET; Civic Bodies Deny Hudson River Project Will Impair Fort Washington Park. TO ASK ACTION AT ALBANY Thirty Persons Attend Bronx Mass Meeting to Criticize Protests of Park Conservationists". The New York Times. March 19, 1925. ISSN 0362-4331. Retrieved June 1, 2018. ^ "Location of Great Anchorage for Fort Lee Bridge in Park Is Cause of New York Protests" (PDF). Newburgh News. February 15, 1926. p. 1. Retrieved June 5, 2018 – via Fultonhistory.com. ^ "CITES BILL PUTTING PARK IN JEOPARDY; Roulstone Declares the Port Authority Is Empowered to Get City Land. FOR USE OF HUDSON BRIDGE Conservation Association Says This Means the Destruction of Fort Washington Plot". The New York Times. March 22, 1925. ISSN 0362-4331. Retrieved June 1, 2018. ^ "GOVERNOR APPROVES 128 BILLS, VETOES 17; STOPS SALARY GRAB; Validates Measure Carrying $18,000,000 in Appropriations and Saves $2,633,000. SANCTIONS HUDSON BRIDGE He Also Authorizes Funds for Two Staten Island-New Jersey Structures. PUTS TEETH IN MARTIN ACT Hearing Dates for Staten Island Tunnel, Voting Machines and Teachers' Pay Are Set. GOVERNOR APPROVES 128 BILLS, VETOES 17". The New York Times. April 3, 1925. ISSN 0362-4331. Retrieved June 1, 2018. ^ a b "SURVEY HUDSON SITE FOR LONGEST BRIDGE; Engineers Pick Foot of 178th Street in Beginning Search for Best Location. TEST BORINGS TO BE MADE Results of Traffic Studies Will Be Considered in the Final Selection". The New York Times. August 18, 1925. ISSN 0362-4331. Retrieved June 3, 2018. ^ "DEFENDS THE PLANS FOR HUDSON BRIDGE; Engineer Says to Move the Approach Out of Park Would Mar the Structure". The New York Times. February 25, 1927. ISSN 0362-4331. Retrieved June 5, 2018. ^ "GILBERT TO DESIGN THE HUDSON BRIDGE; Architect Is Engaged to Make It a Model of Beauty and Engineering Skill. MAY BE SUSPENSION TYPE Port Authority Engages York & Sawyer as Architects for Arthur Kill Spans". The New York Times. 1926. ISSN 0362-4331. Retrieved June 3, 2018. ^ a b c "$50,000,000 BRIDGE TO FT. LEE APPROVED BY INTERSTATE BOARD; Towers to Be Higher Than the Washington Monument -- Span the Greatest in the World. COULD BE OPENED IN 1933 Self-Sustaining After the First Year and Paid Up in 30 Years, Engineers Say. TOLLS ON 4 TRAFFIC LANES Huge Arches Planned in Hudson's Picturesque Setting -- Public Hearings to Be Held. $50,000,000 BRIDGE TO FT. LEE APPROVED". The New York Times. March 13, 1926. ISSN 0362-4331. Retrieved June 3, 2018. ^ a b "REPORTS PROGRESS ON HUDSON BRIDGE; Amman, Chief Engineer, Tells Port Authority of Economy in Construction. WORK ON JERSEY TOWER Contract for Bridge Floors Let to McClintic-Marshall--Steel Award to Roebling's Sons. 3,500-Foot River Span Planned. Bridge to Have Two Decks. $5,250,000 Estimated 1932 Revenue". The New York Times. March 11, 1928. ISSN 0362-4331. Retrieved June 5, 2018. ^ "HUDSON SUSPENSION SPAN WILL BE CAREFULLY TESTED; But Improved Methods and Materials Have Almost Eliminated Bridge Perils". The New York Times. July 18, 1926. ISSN 0362-4331. Retrieved June 3, 2018. ^ "Materials Entering Into Big Span Across Hudson River at Fort Lee Will be Well Tested" (PDF). Newburgh News. August 12, 1926. p. 16. Retrieved June 8, 2018 – via Fultonhistory.com. ^ "TELLS HUDSON SPAN PLANS. ; Engineer Says Work on New Bridge Will Start Next Summer". The New York Times. October 21, 1926. ISSN 0362-4331. Retrieved June 3, 2018. ^ "FINAL HEARING BACKS HUDSON BRIDGE PLAN; 200 Organizations Present to Express Approval With No Dissenting Voice. GOES TO WASHINGTON, NOW Approval of Secretary of War Expected in Month, Clearing Way Toward Construction. MAY ALTER THE CLEARANCE 95 Feet In Present Drawings -- -Not Enough for Leviathan, but Ample for Warships". The New York Times. December 3, 1926. ISSN 0362-4331. Retrieved June 3, 2018. ^ "GETS FINAL PERMIT FOR HUDSON BRIDGE; Port Authority Receives War Department Approval -- Plans to Call for Bids Soon. BONDS ON MARKET TODAY Syndicate Headed by National City Company Will Offer a $20,000,000 Issue". The New York Times. December 14, 1926. ISSN 0362-4331. Retrieved June 3, 2018. ^ "FORT LEE BRIDGE BONDS ARE AWARDED; Port Authority Accepts Bid on $20,000,000 to Finance Span Over the Hudson. MAY BE OFFERED MONDAY National City Co. Headed Bankers, Bidding 95.6377 -- Work on Structure to Begin Soon". The New York Times. December 10, 1926. ISSN 0362-4331. Retrieved June 3, 2018. ^ "JERSEY BRIDGE BILL FACES COURT FIGHT; Attack on Measure Is Expected by Silzer, With Damage to Port Authority Work. PASSED BY BOTH HOUSES Governor Indicates He Will Sign Measure Despite Protest of New York Executive. DOUBT CONSTITUTIONALITY Commission's Power Over All Contracts Violates Treaty, Foes of Proposal Declare". The New York Times. March 26, 1927. ISSN 0362-4331. Retrieved June 5, 2018. ^ "Treaty Abrogation on Port Authority Between New York and New Jersey Go to Court" (PDF). Ballston Spa Daily Journal. March 28, 1927. p. 1. Retrieved June 5, 2018 – via Fultonhistory.com. ^ "STILL SEEK WAY OUT OF BRIDGE TANGLE; Jersey Legislators Meet Again Today in Effort to Repeal the Simpson Act. FACE SMITH TEST OF LAW Silzer Denies Ban on Cable Firms' Bids Was Planned -- Wire Firm Repudiates Legislation". The New York Times. April 1, 1927. ISSN 0362-4331. Retrieved June 5, 2018. ^ "NO UPSET LIKELY IN BRIDGE PROGRAM; Governor Moore Is Not Expected to Alter Policy Despite New Veto Power. AIMS OF ACT OUTLINED Its Effect Will Be to Check Up on State Executives and Port Authority Alike". The New York Times. April 3, 1927. ISSN 0362-4331. Retrieved June 5, 2018. ^ "FIRST BIDS OPENED FOR FT LEE BRIDGE; Port Authority Takes Initial Step Toward the Actual Construction of Span. $1,160,200 LOWEST BID Contracts for Foundations and Tower Bases Will Be Let Within 14 Days". The New York Times. April 12, 1927. ISSN 0362-4331. Retrieved June 5, 2018. ^ "MORE TIME ON BRIDGE BIDS. ; Port Heads Get Extension to Await City Action on Fort Lee Span". The New York Times. April 25, 1927. ISSN 0362-4331. Retrieved June 5, 2018. ^ "FIRST CONTRACT LET FOR HUDSON BRIDGE; Silas B. Mason Gets Award for Foundations on the New Jersey Side. THE LOW BID IS $1,160,200 Port Authority Buys Washington Heights Real Estate for the Manhattan Approach". The New York Times. April 30, 1927. ISSN 0362-4331. Retrieved June 5, 2018. ^ "18 BIDS RECEIVED ON HUDSON BRIDGE; New Jersey Anchorage and Approach Offers Opened by Port Authority". The New York Times. June 1, 1927. ISSN 0362-4331. Retrieved June 5, 2018. ^ "Biggest Dredge in World Starts Work To Prepare Hudson River for Bridge". The New York Times. May 8, 1927. ISSN 0362-4331. Retrieved June 5, 2018. ^ "SEEKS LAND AT FORT LEE. ; Port Authority Starts Condemnation Proceedings for New Bridge Work". The New York Times. August 29, 1927. ISSN 0362-4331. Retrieved June 5, 2018. ^ "GROUND IS BROKEN FOR HUDSON BRIDGE; Acting Mayor McKee Digs Earth at 178th Street, Mayor White on New Jersey Shore. PLANES SOAR OVER RIVER Governors of Both States Heard by Radio on Both Banks From Steamer in Hudson. SEE FRIENDSHIP CEMENTED Smith Says Span Will Increase Prosperity -- Moore Calls It Monument to Progressive Spirit". The New York Times. September 22, 1927. ISSN 0362-4331. Retrieved June 5, 2018. ^ International News Service (September 22, 1927). "Start Digging For New Span" (PDF). Yonkers Statesman. p. 9. Retrieved June 5, 2018 – via Fultonhistory.com. ^ a b "World's Largest Suspension Bridge, Over Hudson River, To Be Opened to Traffic in 1932" (PDF). Brooklyn Daily Eagle. March 11, 1928. pp. 20A. Retrieved June 8, 2018 – via Fultonhistory.com. ^ "OPEN BIDS FOR SPAN OVER HUDSON RIVER; Port Authority Commissioners Find Sharp Contest Between Cable and Eyebar Methods. LOWEST OFFER $22,474,417 Award for Steel Superstructure of $60,000,000 Project Will Be Made Later This Month". The New York Times. October 4, 1927. ISSN 0362-4331. Retrieved June 5, 2018. ^ Steinman, David Barnard (1922). A Practical Treatise on Suspension Bridges: Their Design, Construction and Erection. Wiley. ^ "BRIDGE STEEL ORDERED. ; McClintic-Marshall Gets Contract for Hudson River Span". The New York Times. October 21, 1927. ISSN 0362-4331. Retrieved June 5, 2018. ^ "3 DROWN AT WORK IN HUDSON CAISSON; Rush of Water Through Leak Traps Men Fifty Feet Below Surface of River. TWO ESCAPE UP LADDER Divers Find Only Two Bodies of Builders of Foundation for Interstate Span. THE HUDSON BRIDGE DISASTER. 3 DROWN AT WORK IN HUDSON CAISSON". The New York Times. December 24, 1927. ISSN 0362-4331. Retrieved June 5, 2018. ^ "HUDSON BRIDGE BIDS IN FOR MANHATTAN SIDE; Lowest of 32 Offers Is Made by Arthur McMullen Company With $986,600". The New York Times. March 6, 1928. ISSN 0362-4331. Retrieved June 5, 2018. ^ "FAST BRIDGE WORK AT STATEN ISLAND; Two Great Spans Over the Arthur Kill Will Be Opened in July. TWO STATES WILL BENEFIT Former Governor Silzer of New Jersey Stresses Future Commercial Values". The New York Times. April 15, 1928. ISSN 0362-4331. Retrieved June 5, 2018. ^ "GROOVE CUT IN PALISADES FOR HUDSON BRIDGE ROAD; Trap Rock Now Being Bored for the Cable Anchorages--Work Is Ahead of Schedule Tower Piers Ready". The New York Times. May 6, 1928. ISSN 0362-4331. Retrieved June 5, 2018. ^ "BOND MEN WATCH HUDSON RIVER SPAN; Question Is Raised Whether the Port Authority Will Do Any More Financing This Year. $30,000,000 MORE NEEDED Of $20,000,000 Securities Sold $10,000,000 Had Been Spent on June 30 in $50,000,000 Project". The New York Times. September 29, 1928. ISSN 0362-4331. Retrieved June 5, 2018. ^ Poore, C. g (October 7, 1928). "BRIDGING THE HUDSON A SPECTACULAR JOB; Great Towers Are Rising at the Anchorages and Soon Men Will Weave the Long Span". The New York Times. ISSN 0362-4331. Retrieved June 5, 2018. ^ "BUYS FINAL PLOT FOR HUDSON BRIDGE; Port Authority Rounds Out Manhattan Approach on Upper West Side. OWNED BY FOGEL ESTATE Surrogate Authorized Deal After Adjusting Orphanage Bequests in Original Will. Surrogate Permitted Sale. Gentleman's Agreement Fulfilled". The New York Times. April 14, 1929. ISSN 0362-4331. Retrieved June 5, 2018. ^ a b "Bridge Approaches Beautify Hudson; Riverside Drive Approach to Hudson River Bridge". The New York Times. April 18, 1929. ISSN 0362-4331. Retrieved June 5, 2018. ^ "TO RAZE 20 FLATS IN PATH OF BRIDGE; Wreckers Soon to Clear Three Washington Heights Blocks for Approach. 2 CHURCHES ALSO DOOMED Half of 3,000 Tenants Ousted for Hudson River Span Stay in the Vicinity, Realty Men Report". The New York Times. October 27, 1929. ISSN 0362-4331. Retrieved June 5, 2018. ^ "MUNICIPAL LOANS. ; Port of New York Authority". The New York Times. October 23, 1929. Retrieved June 18, 2018. ^ a b "Plan to Eliminate Hudson Span Plaza; New Plan for Jersey Approach to Bridge". The New York Times. January 8, 1930. ISSN 0362-4331. Retrieved June 6, 2018. ^ Peterson, Iver (November 12, 1991). "Squaring Traffic Circles With Lights and Bridges". The New York Times. Retrieved June 6, 2018. ^ "Land for the New Hudson River Bridge Approaches to Cost Over $10,000,000". The New York Times. April 20, 1930. ISSN 0362-4331. Retrieved June 6, 2018. ^ "FIRST WIRE HOISTED FOR HUDSON BRIDGE; Officials of Two States on Boat See 3,500-Foot Cable Stretched Across River. LEHMAN AND LARSON TALK Hail Advance in New York-Jersey Relations--Knights Asks Union of Port Authority and Commission. Lehman Heads New York Group. Calls It". The New York Times. July 10, 1929. ISSN 0362-4331. Retrieved June 5, 2018. ^ Poore, C. g (September 15, 1929). "A DIZZY TASK FOR MEN WITHOUT NERVES; Sure-Footed Are the Workers Who Have Raised the Mighty Towers of The Hudson River Bridge A DIZZY TASK IN THE AIR". The New York Times. ISSN 0362-4331. Retrieved June 5, 2018. ^ "HUDSON RIVER BRIDGE NOW 50% COMPLETE; Work Is Two Months Ahead of Schedule, Report of Chief Engineer Will Show". The New York Times. February 25, 1930. ISSN 0362-4331. Retrieved June 6, 2018. ^ "PUSHES HUDSON SPAN WORK; Engineer Says Bridge Cables Are About Half Completed". The New York Times. April 19, 1930. ISSN 0362-4331. Retrieved June 6, 2018. ^ a b "FINISH FIRST CABLE FOR HUDSON BRIDGE; Workmen to Complete Three Others on 178th Street Span Within Two Weeks. TASK AHEAD OF SCHEDULE Mayor Transfers Approach Site for $279,000--Contracts Let for Manhattan Ramp and Tunnel". The New York Times. July 29, 1930. ISSN 0362-4331. Retrieved June 6, 2018. ^ "TO COMPLETE SPAN CABLES. ; Workmen to String Last Wires Thursday on Hudson Bridge". The New York Times. August 5, 1930. ISSN 0362-4331. Retrieved June 6, 2018. ^ Poore, C. g (July 14, 1929). "WEAVING BRIDGE CABLES HIGH ABOVE THE HUDSON; The First Thin Strand Connecting the Two Shores Is the Beginning of a Web That Must Ultimately Hold Up 180,000,000 Pounds Between the Towers". The New York Times. ISSN 0362-4331. Retrieved June 5, 2018. ^ a b "NEW DECK BEGUN ON BRIDGE HERE; Platforms Being Put Up on George Washington Span for Building 2d Level". The New York Times. June 2, 1959. Retrieved June 15, 2018. ^ "WILL GET BIDS MONDAY ON BRIDGE APPROACH; Port Authority Plans Tunnel and Ramp at City End of Hudson Span". The New York Times. July 10, 1930. ISSN 0362-4331. Retrieved June 6, 2018. ^ "FT. LEE BRIDGE TO HAVE APPROACH 350 FT. WIDE; New Jersey Will Receive Bids for Roadway Containing 35 Lanes of Ten Feet Each". The New York Times. August 6, 1930. ISSN 0362-4331. Retrieved June 6, 2018. ^ "12 BID ON BRIDGE DRIVES. ; Connections With Hudson Span to Cost $995,969 to $1,497,740". The New York Times. September 16, 1930. ISSN 0362-4331. Retrieved June 6, 2018. ^ a b Maeder, Jay (February 17, 2011). "Name That Bridge, 1931 Edition". The New York Times. Retrieved March 18, 2011. ^ "SEEK NAME FOR BRIDGE. ; Suggestions Being Received for New Hudson Span". The New York Times. October 26, 1930. ISSN 0362-4331. Retrieved June 6, 2018. ^ "Washington Memorial Bridge Is Name of New Hudson Span". The New York Times. January 14, 1931. ISSN 0362-4331. Retrieved June 8, 2018. ^ "INFORMS PRESIDENT OF BRIDGE NAMING; Washington Memorial Group Calls at White House About Fort Lee Span. DEDICATION IS CONSIDERED Hoover Is Expected to Deliver Address--Two Other Bridges HereCalled Washington". The New York Times. January 15, 1931. ISSN 0362-4331. Retrieved June 8, 2018. ^ "Port Board Votes to Rename Hudson Bridge; Bows to Protests on 'Washington Memorial'". The New York Times. January 23, 1931. ISSN 0362-4331. Retrieved June 8, 2018. ^ "NEW BRIDGE NAMES POUR IN; Wide Range of Suggestions for Hudson Span Sent to Port Authority". The New York Times. January 30, 1931. ISSN 0362-4331. Retrieved June 8, 2018. ^ "WASHINGTON LEADS AS NAME FOR BRIDGE; But More Individual Letters to the Port Authority Propose Palisades Designation. MAIL SWAMPS COMMITTEE Columbus and Hendrik Hudson Are Next in Popularity as Flood of Suggestions Grows". The New York Times. February 12, 1931. ISSN 0362-4331. Retrieved June 8, 2018. ^ "HUDSON SPAN NAMED GEORGE WASHINGTON; Port Commissioners Approve Disputed Designation as a Tribute to Early Patriots. RECALL HISTORY OF SITE Deem Structure a Monument to the Valor of Republic's Founders-- One Votes in Dissent". The New York Times. April 24, 1931. ISSN 0362-4331. Retrieved June 8, 2018. ^ "GIANT SPAN GIVEN NAME" (PDF). Buffalo Courier Express. April 24, 1931. p. 2. Retrieved June 8, 2018 – via Fultonhistory.com. ^ "FINAL RIVETS DRIVEN IN BRIDGE GIRDERS; Workers on Hudson Span Begin Laying Floor Plates for EightLane Roadway". The New York Times. December 30, 1930. ISSN 0362-4331. Retrieved June 8, 2018. ^ "NEW HUDSON BRIDGE TO OPEN THIS YEAR; Port Authority Also Reveals Kill van Kull Span Will Be Ready Before 1932. TO PUSH PIER PURCHASE Tenth Annual Report Urges Aid for Hoboken in Acquisition--Freight Terminals Planned". The New York Times. March 4, 1931. ISSN 0362-4331. Retrieved June 8, 2018. ^ "LAUDS PORT FACILITIES IN BUILDING OF BRIDGE; Authority Describes Ease and Efficiency of Moving Tons of Materials to Hudson Site". The New York Times. March 15, 1931. ISSN 0362-4331. Retrieved June 8, 2018. ^ "FORTY BANKERS HIKE OVER HUDSON BRIDGE; Representatives of Interests That Bought $50,000,000 Bonds for It First to Cross. RIDE TO TOP OF TOWER Expectation of $4,500,000 in Tolls for First Year Called Basis of Good Investment. Have Luncheon in New Jersey. Those Who Made the Trip". The New York Times. June 24, 1931. Retrieved June 25, 2018. ^ "New Jersey Hlghways to Serve New Hudson River Bridge". The New York Times. April 26, 1931. ISSN 0362-4331. Retrieved June 8, 2018. ^ "ASKS FUNDS TO PLAN NEW HARLEM BRIDGE; Goldman Seeks $50,000 to Survey for Link to Speed TrafficUsing Hudson River Span.177TH ST. SITE PROPOSEDAction Is Requested to ExpediteTravel Across the Bronx IntoWestchester and New England". The New York Times. May 6, 1931. ISSN 0362-4331. Retrieved June 8, 2018. ^ "BRIDGE BIDS OPENED. ; Four Cover Work of Building Washington Span Booths and Towers". The New York Times. July 7, 1931. ISSN 0362-4331. Retrieved June 8, 2018. ^ a b c "56,312 Cars Cross Bridge on First Day". The New York Times. October 26, 1931. Retrieved March 6, 2010. ^ "PEDESTRIANS TO GET LOWER BRIDGE TOLL; Charge on George Washington Span Will Be Cut From 10 to 5 Cents About Jan. 1". The New York Times. November 9, 1934. ISSN 0362-4331. Retrieved June 9, 2018. ^ "Speeding the Hudson Bridge". Popular Science. November 1929. p. 49. Retrieved October 19, 2011. ^ Warner, Arthur (October 18, 1931). "AN ASTOUNDING SPAN OF STEEL AND WIRE; The New Bridge and Approaches Stretch For a Distance of Nearly Two Miles Eight Traffic Lanes. A Barrier Conquered. Six Months Ahead of Schedule. A Heavy Traffic Increase". The New York Times. ISSN 0362-4331. Retrieved June 8, 2018. ^ "HEAVY REALTY SALES IN BERGEN COUNTY; Hirliman Firm Reports Deals Exceeding $7,000,000 Since Work on Bridge Started". The New York Times. June 8, 1930. ISSN 0362-4331. Retrieved June 6, 2018. ^ a b Hanley, Robert (October 25, 1981). "WHAT HATH A BRIDGE WROUGHT". The New York Times. Retrieved June 28, 2018. ^ "More Autos Use Tunnel Than New Bridge; Extra Force to Handle Travel on Span Today". The New York Times. November 1, 1931. ISSN 0362-4331. Retrieved June 9, 2018. ^ "BRIDGE SERVICE EXTENDED. ; 4 New Toll Lanes Planned for Heavy Sunday Traffic on Hudson Span". The New York Times. October 31, 1931. ISSN 0362-4331. Retrieved June 9, 2018. ^ "Washington Bridge a Year Old; Earnings Put at $1,200,000". The New York Times. October 25, 1932. ISSN 0362-4331. Retrieved June 9, 2018. ^ "HUDSON BRIDGE LINK READY; Direct Road to Paterson Will Be Opened on Thursday". The New York Times. July 24, 1932. ISSN 0362-4331. Retrieved June 10, 2018. ^ "TUBE TO HUDSON SPAN TO BE READY IN FALL; 2,000-Foot Vehicular Tunnel Under 178th Street Nearly Com- pleted -- For Bridge Traffic Only". The New York Times. 1932. ISSN 0362-4331. Retrieved June 9, 2018. ^ a b c Mathieu, George M. (July 23, 1939). "CITY'S IMPROVED EXITS READY; New Approaches to George Washington Bridge and the Tunnel Under 178th Street Expected to Ease Flow of Traffic Bridge Section Open Link With Parkways". The New York Times. ISSN 0362-4331. Retrieved June 9, 2018. ^ "NEW BRIDGE RAMP READY; Westbound Entrance to Washington Span to Open Today". The New York Times. April 7, 1939. ISSN 0362-4331. Retrieved June 10, 2018. ^ "HUDSON SPAN MARKS TENTH ANNIVERSARY; Foresight of Designers Lauded in Broadcast From Bridge". The New York Times. October 26, 1941. ISSN 0362-4331. Retrieved June 10, 2018. ^ a b c d e f g h "New 6 Lane Lower Level Adds 75% to Capacity" (PDF). Riverdale Press. August 30, 1962. p. 12. Retrieved June 18, 2018 – via Fultonhistory.com. ^ "200 Washington Bridge Lights To Warn Night-Flying Aviators". The New York Times. May 30, 1931. ISSN 0362-4331. Retrieved June 8, 2018. ^ "PHOTO BAN EMPHASIZED; Port Authority Says No Tunnel or Bridge Views Are Allowed". The New York Times. July 24, 1942. ISSN 0362-4331. Retrieved June 10, 2018. ^ "BRIDGE LIGHTS ON TONIGHT; Cables of George Washington Span to Glow After 3 Years". The New York Times. May 15, 1945. ISSN 0362-4331. Retrieved June 10, 2018. ^ "Excerpts From Proposal to Meet City's Bridge and Highway Needs for Next 2 Decades". The New York Times. January 17, 1955. Retrieved June 15, 2018. ^ a b "Little Falls Resident Works On George Washington Bridge Project" (PDF). Little Falls Herald. July 26, 1960. p. 12. Retrieved June 15, 2018 – via Fultonhistory.com. ^ Ingraham, Joseph C. (March 5, 1956). "PLAN FOR 2 DECKS ON BRIDGE FADES; Bergen Leader Virtually Kills George Washington Span Change--Cites Foes 20THER PROPOSALS GAIN Jersey to Act on Narrows Structure--Throgs Neck Project Is Approved Key to Throgs Neck Span". The New York Times. Retrieved October 7, 2018. ^ "BRIDGE PROGRAM ADVANCED BY CITY; Planning Commission Takes Formal Action on George Washington Span Work COST TO BE $110,000,000 Changes Are Asked in Port Authority Plan to Build 6-Lane Lower Deck New Deck for Bridge Recommendations Are Made". The New York Times. June 5, 1957. Retrieved June 15, 2018. ^ Ingraham, Joseph C. (July 12, 1957). "FUND IS ALLOTTED BRIDGE TO JERSEY; $182,000,000 Is Set by Port Board for Improving the George Washington Span". The New York Times. Retrieved June 15, 2018. ^ a b c d Stengren, Bernard (February 22, 1960). "George Washington Bridge Loops to Open in Fall; Manhattan Ramps Lead to Highway and Streets Construction Is Linked to Second-Deck Project". The New York Times. Retrieved June 15, 2018. ^ a b c "Dedication Rites Set Tomorrow For George Washington 2nd Deck" (PDF). Tarrytown Daily News. August 28, 1962. p. 5. Retrieved June 18, 2018 – via Fultonhistory.com. ^ "IT'S A ROCKY ROAD TO BIGGER BRIDGE; Men, TNT and Machinery Clear Way to 2d Deck of the George Washington". The New York Times. September 20, 1961. Retrieved June 15, 2018. ^ Ingraham, Joseph C. (October 27, 1959). "Lack of Steel Halts A Bridge Job Here; BRIDGE IS SLOWED BY LACK OF STEEL". The New York Times. Retrieved June 15, 2018. ^ "5-Week Pouring Job Is Begun For Lower Roadway of Bridge". The New York Times. September 28, 1960. Retrieved June 15, 2018. ^ "2D DECK OF BRIDGE NEAR COMPLETION; Work on George Washington Span Rushed for Opening". The New York Times. July 27, 1962. Retrieved June 15, 2018. ^ "Jersey to Open New Ramps With Rise in Bridge Traffic". The New York Times. July 31, 1962. Retrieved June 15, 2018. ^ a b c d e f g h i j k Rockland, Michael Aaron (2008). The George Washington Bridge: Poetry in Steel. New Brunswick, NJ: Rutgers University Press. ISBN 978-0-8135-4375-8. Retrieved July 30, 2013. ^ Scott, Marvin. "Happy birthday George Washington Bridge! See rare 1981 interview with the man who crossed it ON HORSE on the first day", WPIX, October 25, 2013. Accessed June 18, 2016. "And with a total of 14 lanes, it’s the only one of its kind." ^ "New York-New Jersey Win Double Header". Brooklyn Daily. January 18, 1963. pp. 7, 16 – via Fultonhistory.com. ^ "2d Level of Bridge Brings New Record For Hudson Traffic". The New York Times. August 29, 1963. Retrieved June 18, 2018. ^ Osby, Liv (March 3, 1990). "Bridge, tunnel repairs could slow commuters". Daily Record. Morristown, NJ. p. 3. Retrieved November 13, 2018 – via Newspapers.com. ^ "Hudson crossing ramps in NYC will be rebuilt". The Courier-News. Bridgewater, NJ. March 10, 1991. p. 18. Retrieved November 13, 2018 – via Newspapers.com. ^ James, George (September 8, 1990). "Chaos Set Off By Shutdown At Bridge". The New York Times. Retrieved November 20, 2018. ^ "George Washington Bridge Interesting Facts" (PDF). Port Authority of New York and New Jersey. Retrieved February 20, 2017. ^ Schneider, Daniel (September 24, 2000). "F.Y.I." The New York Times. Retrieved February 20, 2017. ^ Yee, Roger (2007). Lighting Spaces. Visual Profile. p. 64. ISBN 9781584711162. ^ a b Egbert, Bill (January 15, 2001). "Wish list likened to Erie Canal impact". New York Daily News. p. 4. Retrieved November 13, 2018 – via Newspapers.com. ^ Khan, Liza (December 27, 2000). "$87M ramp could ease traffic". The Journal-News. White Plains, NY. p. 23. Retrieved November 13, 2018 – via Newspapers.com. ^ Baxter, Christopher. "UPDATED: Timeline of Port Authority's George Washington Bridge controversy". The Star-Ledger. Retrieved March 31, 2014. ^ "For Christie, perhaps a bridge too far". The Washington Post. January 9, 2014. ^ "The backstory of Christie's 'Bridgegate' scandal". USA Today. January 10, 2014. Retrieved February 2, 2014. ^ Strunsky, Steve (October 16, 2013). "George Washington Bridge lane closures prompt internal review, lawmaker outrage". The Star-Ledger. Retrieved April 3, 2014. ^ Chung, Jen (January 9, 2014). "U.S. Attorney Now Investigating Bridgegate". Gothamist. Archived from the original on January 12, 2014. Retrieved January 10, 2014. ^ Costa, Robert (January 13, 2014). "Broader investigation of N.J. bridge closures launched". The Washington Post. Retrieved January 13, 2014. ^ "A Hiring by Christie Raises Questions Over Cooperation". The New York Times. January 16, 2014. Retrieved January 20, 2014. ^ Haughney, Christine (December 8, 2011). "Now 80, George Washington Bridge Will Undergo Repairs". The New York Times. Retrieved December 9, 2011. ^ The Associated Press (August 2, 2013). "New York City's George Washington Bridge to undergo major construction project starting Monday". syracuse.com. Retrieved June 30, 2014. ^ "Overnight repair work on GWB begins; 3 upper-level lanes close down". 7online.com. June 16, 2014. Retrieved July 7, 2014. ^ "A Look at the Timeline for Restoring the George Washington Bridge - New York YIMBY". New York YIMBY. February 2, 2017. Retrieved May 31, 2018. ^ a b "Projects ramping up around the GWB". North Jersey. May 2, 2016. Retrieved November 13, 2018. ^ a b "George Washington Bridge "Restoring the George" Construction Program: Supplemental Information on Bicycle and Pedestrian Access" (PDF). New Jersey Bike and Walk Coalition. Retrieved April 18, 2019. ^ a b c Google (May 30, 2018). "George Washington Bridge" (Map). Google Maps. Google. Retrieved May 30, 2018. ^ a b c "Tolls - Bridges & Tunnels". Port Authority of New York and New Jersey. Retrieved February 27, 2010. ^ Google (July 30, 2013). "GW Bridge ramps to GW Bridge Bus Terminal" (Map). Google Maps. Google. Retrieved July 30, 2013. ^ "MTA Neighborhood Maps: Washington Heights (Fort Washington Park, Highbridge Park)" (PDF). mta.info. Metropolitan Transportation Authority. 2018. Retrieved October 1, 2018. ^ a b LaRock, Hana (December 16, 2013). "How to Avoid the Tolls From New Jersey to New York". USA Today. Retrieved May 31, 2018. ^ a b c d "New Toll Fare Rates for the Bridges & Tunnels Effective December 6, 2015 at 3:00 AM". Port Authority of New York & New Jersey. Retrieved November 23, 2015. ^ "2017 Toll Information". MTA Bridges & Tunnels. Retrieved March 16, 2017. ^ Newman, Andy (October 10, 1997). "Finding Alternatives to Alternate Routes". The New York Times. Retrieved May 31, 2018. ^ "Incentive Pricing Toll Schedules - Cashless Tolling". New York State Thruway. November 7, 2014. Retrieved January 12, 2019. ^ "The Port Authority of NY & NJ - 2012 to 2015 Toll Rate Table (for Bridges & Tunnels)" (PDF). Port Authority of New York & New Jersey. Retrieved November 29, 2013. ^ a b Moran, Nancy (August 13, 1970). "One‐Way Tolls Confusing Some Drivers". The New York Times. Retrieved April 9, 2018. ^ MacFarquhar, Neil (July 29, 1997). "Some Changes Via E-Z Pass at George Washington Bridge". The New York Times. Retrieved September 13, 2018. ^ "E-ZPass bridge tollbooths may be history". Central New Jersey Home News. New Brunswick, NJ. June 19, 2000. p. 3. Retrieved November 13, 2018 – via Newspapers.com. ^ "TOLL RULES FIXED BY PORT AUTHORITY; Scrip Tickets to Be Sold for Interstate Bridges and the Holland Tunnel. GOOD FOR ALL VEHICLES Pedestrian Fare Reduced From 10 to 5 Cents for George Washington Span". The New York Times. December 31, 1934. Retrieved June 18, 2018. ^ "JERSEY BRIDGE TOLLS END FOR PEDESTRIANS; George Washington and Staten Island Spans Are Included". The New York Times. May 29, 1940. Retrieved June 18, 2018. ^ Belson, Ken (January 4, 2007). "With Ad Deal, Insurer Wades Into Bridge Traffic". The New York Times. Retrieved February 27, 2010. ^ Belson, Ken (January 9, 2007). "Agency Cancels Insurer's Ads for George Washington Bridge". The New York Times. Retrieved February 27, 2010. ^ Strunsky, Steve. "How the George Washington Bridge toll has risen through the years", NJ Advance Media for NJ.com, December 5, 2014. Accessed June 19, 2016. ^ "TWO GOVERNORS OPEN GREAT HUDSON BRIDGE AS THRONGS LOOK ON; 5,000 Attend Exercies Held in Centre of $60,000,000 Span Linking Palisades to City. TRIBUTES TO WASHINGTON Longest Suspension Crossing Dedicated to First President as Planes Soar Overhead. SCENES AT OPENING OF THE NEW HUDSON RIVER BRIDGE AND DIAGRAMS OF THE APPROACHES TO IT". The New York Times. October 25, 1931. Retrieved June 25, 2018. ^ "Port Authority Bridge and Tunnel Tolls Increase at Midnight". The New York Times. May 5, 1975. ISSN 0362-4331. Retrieved April 9, 2018. ^ Anderson, Susan Heller; Carroll, Maurice (December 21, 1983). "New York Day by Day". The New York Times. Retrieved April 10, 2018. ^ "Tolls to Rise April 12 on Hudson Crossings". The New York Times. April 3, 1987. Retrieved April 10, 2018. ^ Levine, Richard (March 23, 1991). "Port Authority Raises Tolls for 6 Bridges and Tunnels to $4". The New York Times. Retrieved April 10, 2018. ^ Smothers, Ronald (January 26, 2001). "Port Authority Increases Tolls and Train Fare". The New York Times. Retrieved April 10, 2018. ^ Epstein, Joe (January 4, 2008). "Port Authority raises bridge and tunnel toll to $8". NJ.com. Retrieved April 16, 2018. ^ "Commuters Face Higher Hudson River Crossing Tolls For Start Of Work Week". CBS New York. New York: WCBS-TV. September 18, 2011. Retrieved April 16, 2018. ^ "Toll Increases Take Effect On Port Authority Crossings". CBS New York. New York: WCBS-TV. December 2, 2012. Retrieved April 16, 2018. ^ "Tolls Going Up At Port Authority Crossings". CBS New York. New York: WCBS-TV. December 5, 2014. Retrieved April 16, 2018. ^ "Latest round of Port Authority toll hikes take effect this weekend". ABC7 New York. New York: WABC-TV. December 4, 2015. Retrieved April 16, 2018. ^ a b "Pedestrian & Bicycle Information - George Washington Bridge". Port Authority of New York and New Jersey. Retrieved February 27, 2010. ^ "State Bicycle Route 9 Map". New York State Department of Transportation. Retrieved January 12, 2019. ^ Yellin, Deena (October 12, 2014). "A controversial planned GWB pedestrian lane attracts critics". The Record (Bergen County). Archived from the original on October 14, 2014. Retrieved June 19, 2016. It includes replacing stairways on the bridge's north side with access ramps and removing a tight hairpin turn on the south side walkway to make it safer and accessible to wheelchairs. ^ "Support Grows in NJ for GW Bridge to "River Road" Connector Path". Transportation Alternatives Magazine. Transportation Alternatives: 15. Summer 2003. Retrieved February 27, 2010. ^ Zabriskie, Phil. "The Mysteries of the Suicide Tourist". New York Magazine. New York Media LLC. Retrieved April 13, 2012. ^ Dittrich, Luke (August 9, 2016). Patient H.M.: A Story of Memory, Madness, and Family Secrets. Random House Publishing Group. pp. 27–29. ISBN 9780679643807. ^ Associated Press (September 22, 1930). "213-FOOT LEAP KILLS STUNTER" (PDF). Troy Times. p. 1. Retrieved June 5, 2018 – via Fultonhistory.com. ^ "DIES IN STUNT DIVE FROM FT. LEE BRIDGE; Professional Daredevil's Back Is Broken in 220-Foot Drop Into the Hudson. LEAP STAGED FOR CAMERAS Diver Had Arranged to Sell Story and Pictures to Newspaper--Manager Arrested. Evaded Bridge Watchmen. DIES IN STUNT DIVE FROM FT. LEE BRIDGE". The New York Times. September 22, 1930. ISSN 0362-4331. Retrieved June 6, 2018. ^ "First Suicide at New Bridge; Pedestrians See Man Jump". The New York Times. November 4, 1931. ISSN 0362-4331. Retrieved June 9, 2018. ^ Shock Jock Howard Stern Stops Caller's Suicide Leap : Media: Man phoned in threat from edge of bridge. Radio personality says he decided to 'keep this man laughing' until authorities could arrive. Los Angeles Times (December 8, 1994). Retrieved on July 23, 2013. ^ Weber, Bruce (December 8, 1994). "Now a Caller From the G. W. Bridge: Stern to the Rescue". The New York Times. Retrieved June 28, 2018. ^ Messing, Philip (January 14, 2013). "Sad GWB suicide record". New York Post. Retrieved January 14, 2013. ^ "12 people jumped to deaths from George Washington Bridge in 2016". ^ Tracy, Thomas; Greene, Leonard (February 21, 2017). "EXCLUSIVE: Port Authority eyeing harness-equipped suicide prevention units on George Washington Bridge". nydailynews.com. Retrieved September 12, 2018. ^ "At George Washington Bridge, a Fence Rises to Deter Suicides". The New York Times. December 29, 2017. ISSN 0362-4331. Retrieved June 9, 2018. ^ "PILOT, 19, DEFENDS BRIDGE LANDING; Rejected Jersey Meadows as 'Too Sloppy' and Didn't Consider Central Park". The New York Times. December 28, 1965. Retrieved June 18, 2018. ^ McFadden, Robert D. (June 10, 1977). "Two Trucks Rip Net Over Hudson, But Bridge Beam Catches the Cabs". The New York Times. Retrieved June 25, 2018. ^ a b McFadden, Robert D. (August 8, 1980). "A PROPANE GAS LEAK ON BRIDGE TO JERSEY CAUSES HUGE TIE-UP". The New York Times. Retrieved June 28, 2018. ^ Buder, Leonard (August 9, 1980). "Koch Salutes 2 Who Plugged Propane Leak; 'It Seemed Logical'". The New York Times. Retrieved June 28, 2018. ^ Farber, M.a. (August 8, 1980). "Tank Truck Followed Regulations, Officials Report; Trucker 'Saw Gas Going Up'". The New York Times. Retrieved June 28, 2018. ^ Farber, M.a. (August 9, 1980). "PROPANE LEAK SPURS STUDY BY NEW YORK; Issue of Moving Hazardous Cargo Through Cities Re-examined Propane Leak Prompts Study on Hazardous Cargo Bronx Derailment Recalled". The New York Times. Retrieved June 28, 2018. ^ Hay, Susan (September 7, 2016). "Sully: The untold story of US Airways Flight 1549 - Toronto". Global News. Retrieved September 18, 2018. ^ "The New York Filming Locations of The Godfather, Then and Now". Scouting NY. January 26, 2014. Retrieved September 18, 2018. ^ The Real Cop Land. New York Magazine. New York Media, LLC. August 18, 1997. p. 30. Retrieved September 20, 2018. ^ "William Schuman's GWB Tribute Finds New Resonance - New York's Classical Music Radio Station". WQXR. January 10, 2014. Retrieved September 17, 2018. ^ Swift, Hildegarde (1942). The Little Red Lighthouse and the Great Gray Bridge. Lynd Ward (illustrator) (2002 ed.). Harcourt, Brace, and World. ISBN 0-15-204571-6. ^ "Atomic War! #1". p. 09. ^ Keighley, Geoff (May 16, 2012). "The Final Hours of Metal Gear Solid 2: Sons of Liberty". GameSpot. Retrieved April 2, 2019. ^ a b c d Megraw, Jeremy (October 25, 2011). "I ♥ G-Dubs: A Love Letter to the George Washington Bridge on Its 80th Birthday". nypl.org. New York Public Library for the Performing Arts. Retrieved September 17, 2018. ^ Rastorfer, Darl (2006). George Washington Bridge : a timeless marvel. New York, N.Y: The Port Authority of New York and New Jersey in association with Darl Rastorfer and Associates. ISBN 978-0-9789640-0-9. OCLC 85791384. ^ "Fort Washington Park Highlights". The Little Red Lighthouse : NYC Parks. June 26, 1939. Retrieved September 17, 2018. For the book itself, see: Swift, Hildegarde (1974). The little red lighthouse and the great gray bridge. New York: Harcourt Brace Jovanovich. ISBN 978-0-15-204573-9. OCLC 695588. Historic American Engineering Record (HAER) No. NY-129, "George Washington Bridge"